Britt Joins the Shimano/PowerPro Team - We've used Shimano reels and PowerPro braided line for years in our guide service with much success and we're proud to announce that we've recently become part of their team. 2010 Speaking Engagement - The NRV chapter of Trout Unlimited will have Britt and Leigh of NROC and author Bruce Ingram speak on March 4th. The meeting is at 7:00 PM at the Montomery County Government building in Christiansburg. Click here for more information. 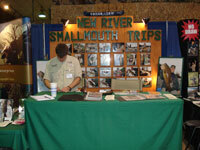 2010 Winter Show Schedule - We will be partcipating in the Raleigh (1/8-1/10), Richmond (1/15-1/17), and Greensboro (1/22-24) Fishing Expos this winter. Please come visit us at our booth and/or seminars. Check out the NC Boat Shows website for more information, seminar schedules and directions. 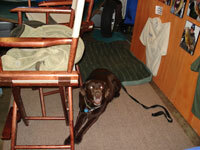 2009 Speaking Engagement - We will be speaking to the Potomac River Smallmouth Club on February 25th. Click here for more information. 2008 Peggy Wallace Vigilance Award - Britt and Leigh were recently awarded the Peggy Wallace Vigilance Award by the National Committee for the New River (NCNR). They are members of the Concerned Citizens of Giles County (CCGC) and were recognized for their efforts in fighting the Cumberland Park Fly Ash Project, a coal-waste disposal site on the banks of the New River in Giles County. For more information on the fight against this project and other issues compromising the health of the New River, please visit the NCNR website and CCGC website. 2008 Conservationists of the Year - Britt and Leigh were recently awarded the "Conservationists of the Year" award from the Potomac River Smallmouth Club for their efforts in fighting against the disposal of coal combustion products in the 100-year flood plain of the New River in Giles County. For more information on the Potomac River Smallmouth Club, please visit their website.